There are plenty of chances for Cherry Hill residents to catch July 4 fireworks in nearby South Jersey communities. Below is a list of free fireworks displays in the region. • Medford: Free Independence Day celebration and fireworks display at Freedom Park. Park opens at 6 p.m. with music and activities. Fireworks will begin at dusk. Rain date is July 3. • Barrington: Barrington Band performs free concert at 7 p.m. at Woodland School, School Lane. Fireworks will go off at approximately 9:30 p.m.
• Haddonfield: Free event. Gates open at 7 p.m. at the high school football field, 401 Kings Highway. Shore Thing performs. Fireworks begin about 9:30 p.m. Rain date is July 5. 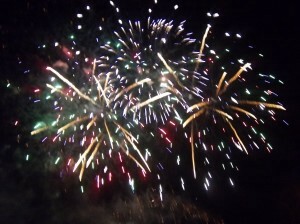 • Valenzano Fireworks Festival: From 5 to 9 p.m. at Valenzano Winery, Shamong. Live music and entertainment. Tickets — $10 for adults, $5 for children — must be purchased at the gate. Rain date is Sept. 18. • Audubon: Free concert and ceremony at 7:30 p.m. at Audubon High School, 350 Edgewood Ave. Fireworks close the evening at dusk. • Collingswood: Free admission as Party Wave Band entertains at the high school stadium, 424 Collings Ave. Gates open at 6:30 p.m. Show begins at 8 p.m. Fireworks at approximately 9:15 p.m.
• Camden Waterfront Independence Day Festival: Fireworks follow a day of free patriotic family fun and live music. Free parking. Fireworks over the Delaware River begin at 9:30 p.m.
• Evesham: Free event. Gates open at 7 p.m. at Cherokee High School, 120 Tomlinson Mill Road. Fireworks begin at 9:30 p.m.
• Philly 4th of July Jam & Grand Finale Fireworks: A free concert on the Benjamin Franklin Parkway featuring The Roots and more. Fireworks follow the music and begin around 10:30 p.m.